Really good product at this point. No heating issue, finger print sensor which is really too fast, solid sound and video experience. Battery takes time to charge, but not that long time as mentioned by many Tech gurus. Sometime camera llacks sharpness in low light, but I can&apos;t complain at this price point, where some other good brands r not giving half of solid features at same price point. This device comes with some really good features at a very affordable price. Featuring an octa core processor with 3GB RAM makes it sufficient to run multiple programs with ease and fastly. Supports Dual Sim LTE. It has an average camera, although high in megapixels but quality is average only. It has stunning battery capacity of 4000 mAh. Lags very less so performance wise the phone is good. This product is an amalgamation of pros and cons. Handy set to use. Features can get better. My mother is happy with this phone as she does not play games and all. But when I do it&apos;s a bit of trouble. *Camera in good light conditions is superb . *Camera clarity in low light below average, especially front facing camera. Value for money. Fingerprint sensor. Good battery life. I am happy with the product. The screen size is compact and the display is pretty good. The build quality however is sacrificed. It&apos;s a good phone for it&apos;s price. 15 Pricebaba users have written their experience with Lenovo K6 Power. 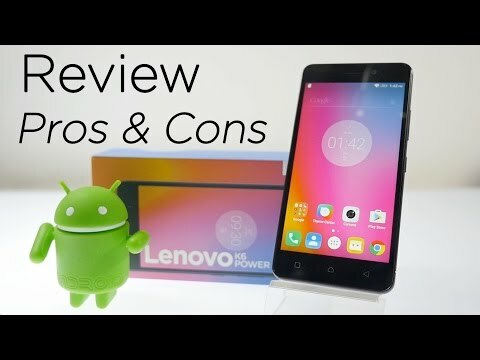 If you own Lenovo K6 Power, please do leave your feedback too. The Chinese consumer electronics giant Lenovo launched the K6 Power in December 2016 in India. This phone competes directly with Xiaomi's Redmi 3S Prime but in a couple of ways better to justify the extra price. Lenovo K6 Power features an all metal unibody construction giving it a premium look & feel. Also the curved edges make it look similar to it's competitor Redmi 3S Prime. On the front of the device sits a 5-inch display that surprisingly has a resolution of 1920x1080 (Full HD) pixels & that gives the display a pixel density of 441PPI. There is no mention of Gorilla Glass protection over the display though. Inside the K6 Power, you will find specs quite similar to the Redmi 3S Prime. It sports Qualcomm's Snapdragon 430 Octa Core chipset that is clocked at 1.4GHz and combined along with it is 3GB of RAM. On the software front is where the K6 Power sounds better, having a near stock UI gives you a smoother & better multitasking experience that runs on top of Android 6.0 Marshmallow. Besides, the phone also features a rear mounted fingerprint sensor and Dolby Atmos stereo speakers. Rear of the K6 Power you will find a 13MP PDAF camera that can record videos up to 1080p. You also get an LED flash to capture moments in low lighting conditions. On the front you get a 8MP camera for selfies & video calling. In terms of storage, this phone comes with 32GB onboard that can be further expanded up to 128GB via a MicroSD card. Packed inside the Lenovo K6 Power is a 4000mAh non user removable battery that should easily last you through the day. The phone comes with standard Bluetooth & WiFi connectivity options & accepts Dual SIMs that supports VoLTE out of the box. Ans: Yes it will work with Reliance Jio network. Ans: Yes it has a hybrid slot. Ans: You will need a microUSB charging connector for the phone. Ans: It seems unlikely that this phone will get any further updates by Android. Ans: The 8MP front camera shall be good enough for selfies.